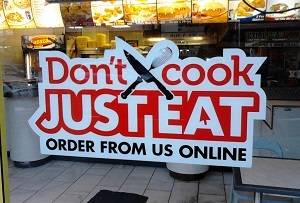 The online takeaway firm has a global appetite. MT wasn’t the only one wolfing down a takeaway delivered by Just Eat last night. The tech firm, which started in Denmark but is now headquartered in London, has a presence in 15 countires around the world, from Mexico to New Zealand, Brazil and Canada. The company has ramped up its global expansion plans and this morning announced it had acquired four major competitors backed by the German start-up accelerator Rocket Internet. The firm will pay €125m (£94m) for the companies which operate in Spain, Italy, Brazil and Mexico in the hope of cementing its place at the top of those markets. Just Eat has been carving up the world’s markets (like a doner kebab) with its big rival Delivery Hero, which is also backed by Rocket Internet and owns Britain’s Hungryhouse, (though both have steered well clear of the US, which is dominated by Chicago-headquartered Grubhub). ‘This sale to JUST EAT represents a positive step forward for the global online takeaway industry enabling all parties to focus their resources on building bigger and better long term businesses in their key geographies,’ said Rocket Internet CEO Oliver Samwer. The rush to international expansion is understandable given the threats Just Eat is dealing with on its own doorstep. Its global order numbers jumped a tasty 57% last year, but last wednesday a note from analysts at Morgan Stanley warned that upmarket competitor Deliveroo is eating into its UK market share - news that sent its share price down by 6% to 398p. Deliveroo’s edge is that it has its own fleet of couriers who collect food direct from restaurants. That has allowed it to sign up eateries that didn’t used to offer takeway food, from big private equity-backed chains like Wagamama to the Michelin-starred Trina. ‘We envisage a time when Just Eat does not have most restaurants on its platform, losing the network effect which is its main barrier to entry,’ said Morgan Stanley analyst Andrea Ferraz. Just Eat's share price regained some ground this morning, jumping 10% on the news of its expansion, but there are clear challenges ahead. Can Just Eat deliver?